Here are some great takeaways from the RHS Chelsea Flower Show 2018. The Royal Horticultural Society’s Chelsea Flower Show takes place in the grounds of the Royal Hospital Chelsea, London, each year. The show hosts the top horticulturalists from around the world. Each year the event showcases the latest and greatest trends from some of the world’s very best garden designer and horticultural companies. 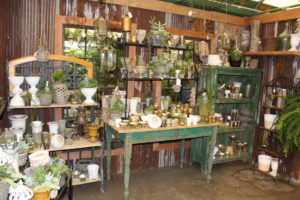 This year our team of North American horticulturalists were lucky enough to visit on press day May 20 to bring back some of the top trends seen for independent retailers here in North America. Fun indoor-outdoor living spaces are increasingly a hot trend, especially where the real-estate footprint inside the home is limited. High-end she sheds, outdoor offices and beautiful lounge/seating areas were a firm trend. Top picks included the LG Outdoor Kitchen & Tom Raffield Home Office (more on Raffield in the sustainable materials trend). House plants were also present in both indoor and outdoor spaces. Used to green up the indoor, many were crossing over into patio and decking areas to enhance the summer tropical look. House plants were present in large numbers this year, especially those with cool architectural foliage like the ZZ Plant, Zamioculcus zamiifolia, and Fiddle-Leaf Fig, Ficus lyrata, for large low-water containers or equally popular cascading types with interesting foliage from contemporary hanging containers such as String of Pearls, Senecio rowleyanus. IKEA created a calming shared indoor office in the Grand Pavilion, filled with fun house plants, many requiring very little water and great for the hectic modern lifestyle. One of our top picks was the Thames Water — Urban Flow rain garden, with wonderful outdoor kitchen and dining space. This garden was designed to capture maximum rain and minimize run off into natural water sources. With permeable pavers set on sand and lush beds filled for flowering plants and edibles, including a fun living wall featuring salad and herbs for quick easy prep in the outdoor kitchen and dining. We also loved the laser cut fall tones of the aged steel. For more information, visit www.thameswater.co.uk/ chelsea. Tom Raffield had us all swooning with his beautiful, sustainably produced wood, grown and manufactured in Cornwall, United Kingdom. The wood had been steamed and shaped into the coolest contemporary designs: hanging containers, beautiful outdoor seating and artful outdoor swings. Raffield and team are happy to export to the U.S. For more information, visit www.tomraffield.com. Color was everywhere at Chelsea 2018. Two in particular were hot favorites — energizing oranges and cool blues. Some of the top plants featured available in North America in 2019 and beyond include Geum ‘Totally Tangerine’, Skyscraper Senecio, Corydalis ‘Porcelain Blue’ and Eryngium ‘Blue Waves’. A North American perennial favorite, Geum ‘Totally Tangerine’ was widely used by the garden designers at Chelsea 2018. With its energizing orange tones being a favorite with pollinator insects, the show gardens were abuzz with bees. This is a Zone 5 hardy perennial in North America and great for adding easy height to perennial borders. It’s widely available; visit www.planthaven.com for more information. The cool new upright blue chalksticks Skyscraper Senecio will be new to North America for retail 2019. The upright stems are excellent to add a vertical element to the border, equally at home as a container plant and in cooler areas, ideal on a bright windowsill as a low water requirement house plant. More information can be found at www. sunsetwesterngardencollection.com. Flowers on the Corydalis ‘Porcelain Blue’ are the brightest blue, looking like they have been blown for art glass. This new addition to North America for 2019 is proving to be much more robust in its garden performance than previous Corydalis. It’s best in moist, rich part shade garden conditions with good available water. Unlike previous selection, ‘Porcelain Blue’ does not go dormant during the summer, keeping fresh blue green fernlike foliage in the shade garden throughout the season and is a true perennial, hardy to Zone 5. True blue flowers are hard to find, and this one really is a keeper with increasing availability in North America for 2019 from PlantHaven. Eryngium ‘Blue Waves’ is perfect for the natural wedding bouquet or a simple hand tie. ‘Blue Waves’ was second in the Chelsea Plant of the Year Competition 2018. A true perennial hardy to Zone 5, great for lower water areas and a popular choice to attract pollinators into the garden. It has limited available in North America for 2019 to 2020 from PlantHaven.